In 2009, God called on Cross Training Sports Camps, Inc. to expand its borders! Named for Maria and Ignacio Conde’s daughter, Elsie, the Elsie Conde Memorial Sports Camp was birthed. The Elsie Camp commemorates the life of baby Elsie who was born with a congenital heart defect and touched so many lives in the two months she was on this earth. This camp is specifically designed to minister to children with special needs. Whether the need is physical or mental, kids ages 6-15 are given the opportunity to participate in our unique Sports Camp. Offering soccer, basketball, baseball and other activities, the kids are loved and given the opportunity to participate and play as much as they desire. 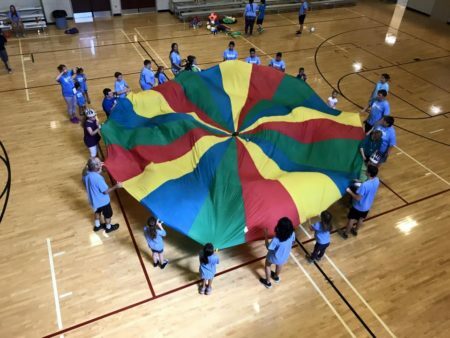 While Elsie is no longer here on this earth, her legacy still stands as campers, parents, and volunteers are all touched by the Elsie Conde Memorial Sports Camps. When I was pregnant and found out I was having a boy the typical things ran through my mind. Hooray! Will he play baseball, football, soccer? Will he have lots of friends, will everyone love him like I will? Then he was born and my whole world changed. I no longer wondered those things, I was now thinking what is his life expectancy? Will he walk? Is his heart strong enough to even be able to play outside? I was overjoyed to have my son finally here, but the sadness of others accepting him and loving him weighed heavily on my mind. When I heard about the CTSC camp my whole family was overjoyed! He would finally be able to play a sport (any sport) which as far as we knew was out of the cards for him. Jonathan loved “practice!” He asked to go back every morning. The people at camp were so loving, accepting, and warm. I felt so comfortable leaving my baby with people who truly cared about his well being. We went from being stared at, to being accepted immediately! Wow! One week gave my baby the opportunity to play just like other children do, make new friends that he will always remember, and I was able to meet families that just like me just want their babies to be happy. God bless those that helped make this camp a reality! Thank you truly from the bottom of my heart.